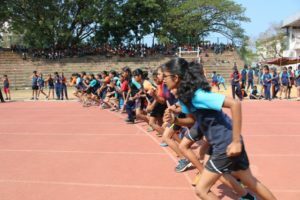 “Sports serve society by providing vivid examples of excellence” said George F Will. 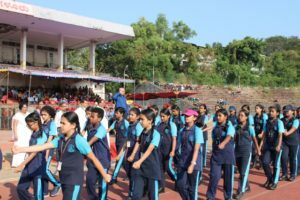 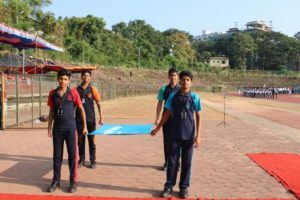 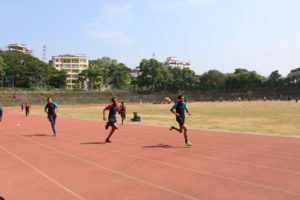 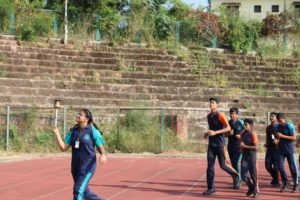 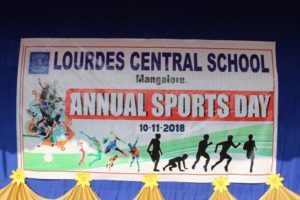 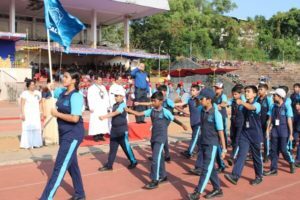 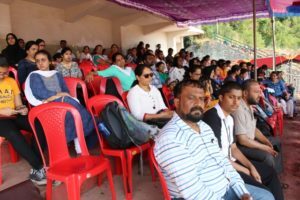 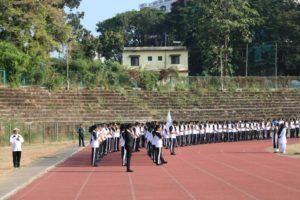 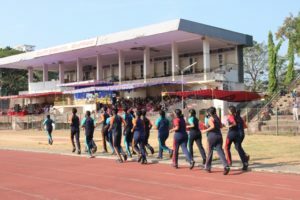 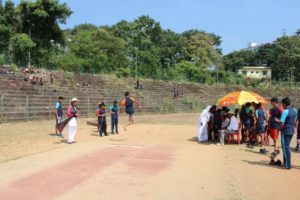 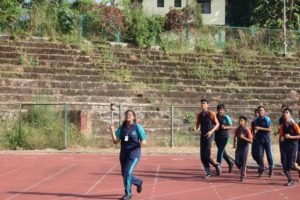 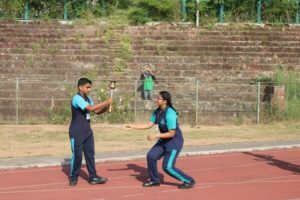 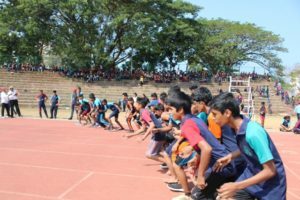 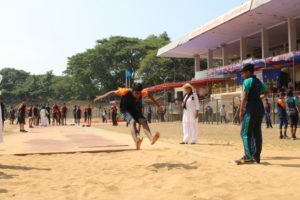 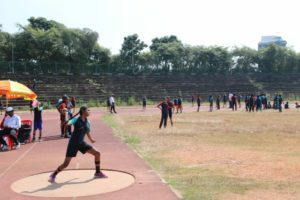 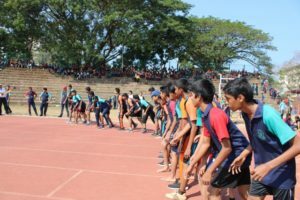 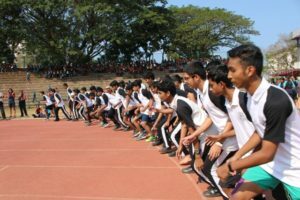 Lourdes Central School organised Annual Sports Day on 10th November 2018 for classes VI to XII at Mangala Stadium, M G Road, Mangaluru. 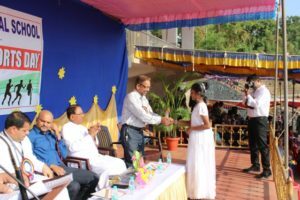 The esteemed dignitaries on the occasion were the Chief Guest Mr Clifford Joseph Joshua, Assistant Manager, Corporation Bank, The President of the function Rev. 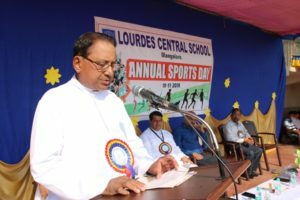 Fr Wilson Vitus D’Souza, Manager, Lourdes Central School, the Principal Rev. 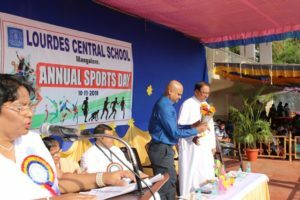 Fr Robert D’Souza, the Vice Principal Mrs Belita Mascarenhas, Vice President of Bejai Parish Pastoral Parishad Mr Stany Vas and Secretary of Bejai Parish Pastoral Parishad Ms Cony Saldanha escorted by the Convenor Mr Vishwanath Devadiga. 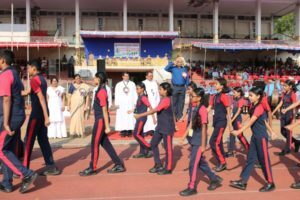 The Inaugural Programme began at 8.30am with the invocation of God’s blessings sung by the school choir under the guidance of Mr Ivan Mascarenhas. 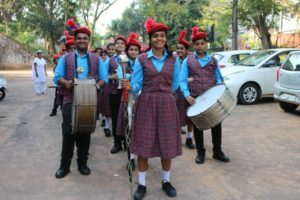 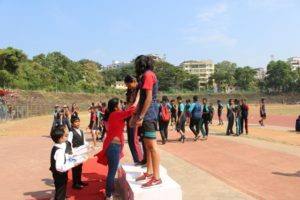 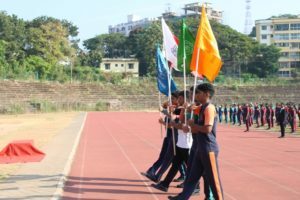 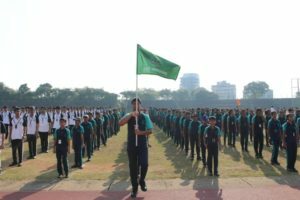 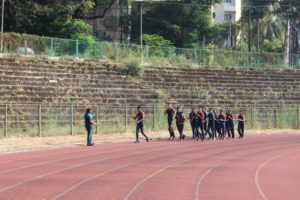 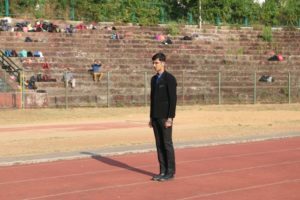 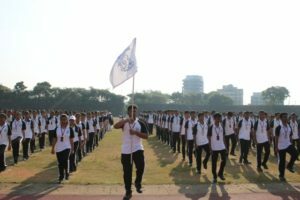 This was followed by the School Parade headed by the head boy Aditya Desai, the head girl Eva Jessica D’Souza, the house captains and vice captains with their respective houses. 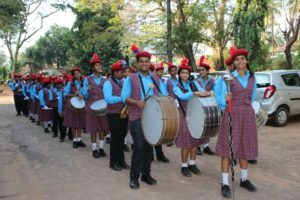 It was indeed a treat to watch the students brimming with enthusiasm, march to the beat of the band. 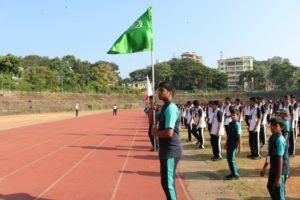 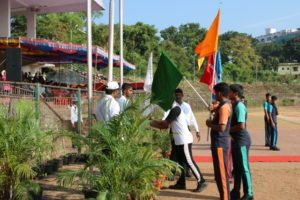 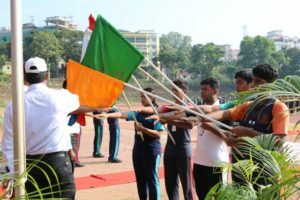 The School flag was ceremonially carried by the worthy sportsmen of the School who are members of the football team and cricket team – Adithya J P, Mihir Shetty, Atul Madhu and Anush Revankar for the flag raising ceremony. 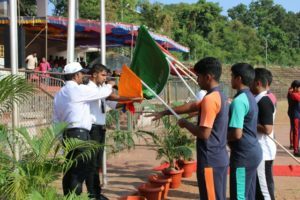 The Chief Guest Mr Clifford Joseph Joshua hoisted the flag. 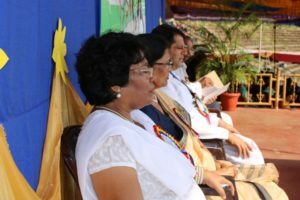 On this joyous occasion, the Vice Principal Mrs Belita Mascarenhas gave the welcome address and introduced the guest. 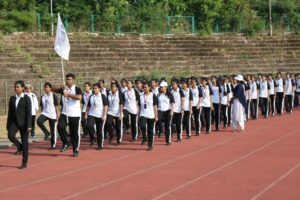 The arrival of the sports torch and the flame symbolises “the light of spirit, knowledge and life.” The torch was borne by our athletes who have emerged winners in various events – Advith Shetty, Captain of the cricket team, Girls handball team – Clea Juana, Shainil Crasta, Shivani Shetty, Frazel Fernandes, Mehek Aranha, Saanchi Suvarna; Amogh Shetty – national level skater, Boys football team – Nihad, Tharun Hegde, Ruben Mascarenhas, Hasib, Abdul Aman, Sanjay Kulal, Ziyan Aboobaker, Jason Madtha; Vaishnavi K S an international karate champion and district level swimmer; and Niranjan Rajeev, an international skating champion. 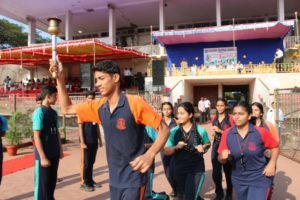 The Chief Guest received the torch and declared the sports meet open. 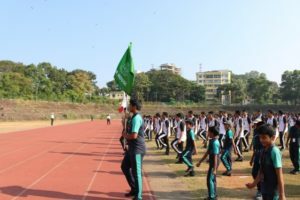 The Sports Minister Anish Mathias, who is the captain of the senior boys football team, state level badminton player and a district level athlete led the oath and recited the pledge. 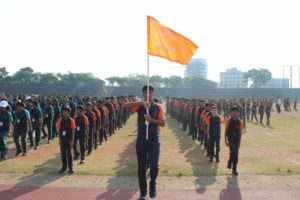 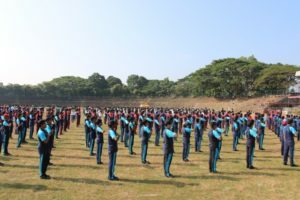 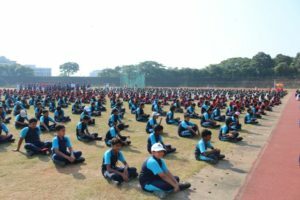 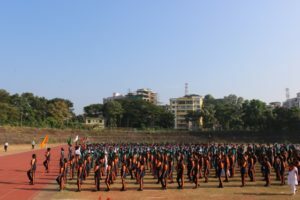 The students gave an impressive show of harmony and discipline through the mass drill. 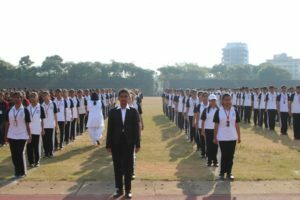 House system song was sung with vigour and gusto. 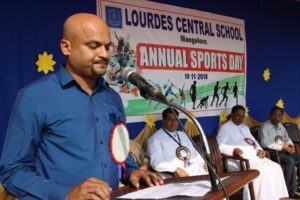 The Chief Guest Mr Clifford Joseph Joshua, Assistant Manager, Corporation Bank, an International Athlete and Ekalavya Awardee addressed the gathering and said that sports teaches one to deal with victory and failure, makes one strong and healthy, and it is an integral part of our life. 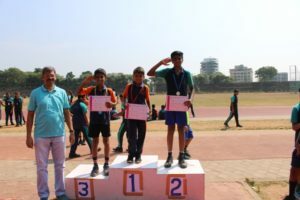 He highlighted saying that hard work is the key to success. 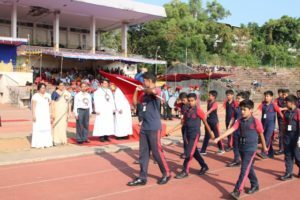 The President of the function Rev. 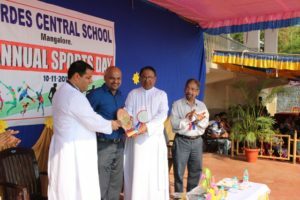 Fr Wilson Vitus D’Souza in his message expressed that success is a matter of choice. 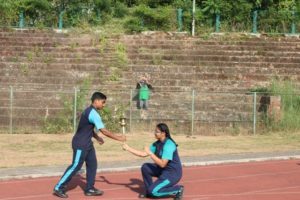 Failure should motivate one to try harder and harder. 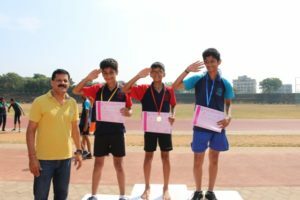 He stressed that winning mind set is important and wished all students to win in all walks of life. 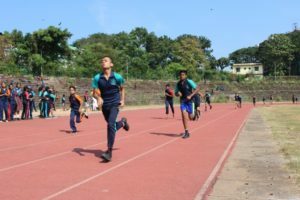 Mr Veerendra Alva, the PT instructor expressed his gratifying thoughts by proposing the vote of thanks. 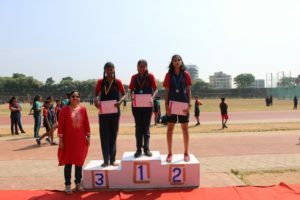 Ms Deepa D’Souza and Ms Vanita Patole compered the programme. 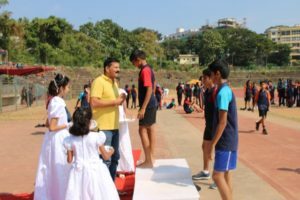 Mr Vishwanath Devadiga and Mr Veerendra Alva were the Convenors of the Annual Sports Day. 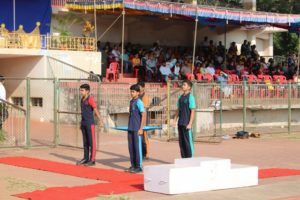 The Valedictory Ceremony commenced at 1.45p.m. 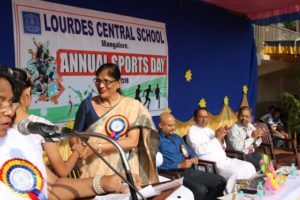 Ms Vivita D’Souza welcomed the gathering. 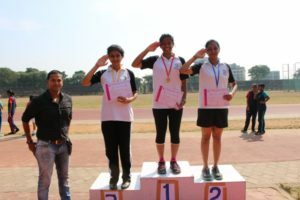 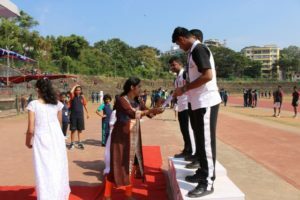 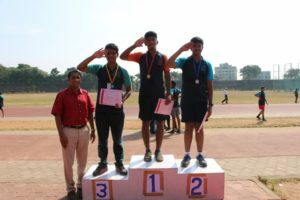 The Vice Principal Ms Belita Mascarenhas, Mr Vishwanath Devadiga and Mr Veerendra Alva felicitated the winners of the relay and individual champions. 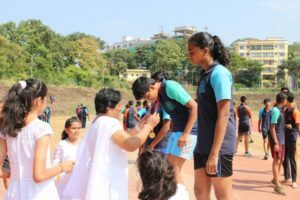 The Vice Principal awarded the Rolling Shield to Amber House and the Runners Up Shield to Opal House. 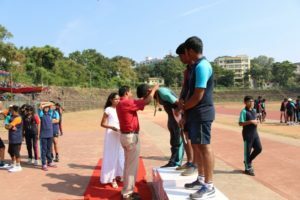 The Convenor of the Annual Sports Day Mr Vishwanath Devadiga proposed the vote of thanks. 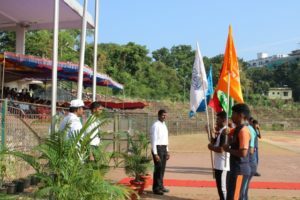 The lowering of the School Flag which marks the end of the closing ceremony was done ceremoniously in the presence of the Vice Principal. 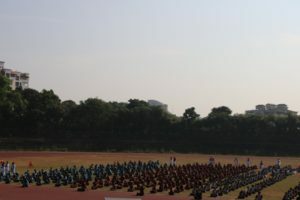 The programme ended with the singing of the National Anthem. 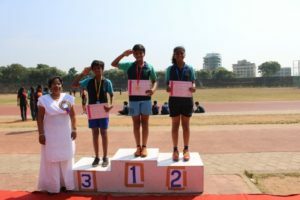 Ms Vivita D’Souza compered the programme.